Israel and China have jointly issued a postal souvenir on Thursday to mark the 10th anniversary of the establishment of diplomatic ties between the two countries. Israeli Minister of Communication Reuven Rivlin said at the issuing ceremony in Tel Aviv that he was pleased that Israel and China chose a postal and philatelic medium to mark this important event. The minister said: “I believe that the common values that our two ancient nations share, alongside with the cooperation that we have established in so many fields will ensure that our relationship will continue to flourish in the decades to come.”…. Rivlin just came back this week from China after signing an agreement for the sale of two communication satellites for broadcasting and the telecommunications for the 2008 Olympic Games in Beijing…. 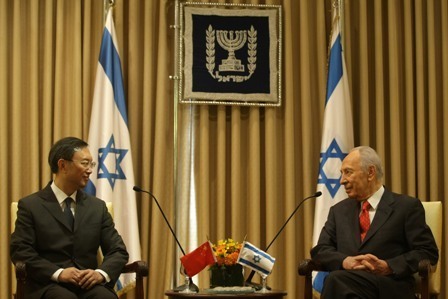 Chinese Ambassador to Israel Pan Zhanlin said he was very pleased to witness the significant development of the profound relations between the two countries. He added that it demonstrates the friendship between the two peoples forged during long-standing contacts and the achievements of cooperation made during the past 10 years. As an active Middle East diplomacy developed on the basis of anti-Soviet goals, Beijing established diplomatic ties with three pro-Western countries between August and November 1971: Turkey, Iran, and Lebanon. It did not, however, restore contact with Israel, for fear of this harming relations with the Arab world. Nonetheless, China and Israel had in the Soviet Union a common opponent and at one time both were fighting Soviet soldiers—Chinese infantry on the common border with Russia, Israeli pilots over the skies of Egypt and Syria. In 1971, Zhou even told Senator Henry Jackson (Democrat of Washington) that China supported Israel in its efforts against Soviet expansion in the Middle East. After 1971, Beijing backed Egypt’s Anwar as-Sadat, Sudan’s Ja‘far an-Numayri, and other Arab leaders as they expelled Soviet forces from their countries.” [Emphasis added]. From 1977 onward China sought to establish contact with all Middle Eastern states, culminating in the establishment of formal relations with Israel in 1992. Israel’s role as a major supplier of arms for China, including sophisticated military equipment originating from the USA, has become a public scandal on several occasions over the past decade. Note that The Times stated the Sino-Israeli relationship is close, secret, and of long duration. Elta, a subsidiary of the Israeli Aircraft Industry, designed Phalcon, a sophisticated radar system for the Chinese Air Force. Israel is China’s second-largest supplier. A recent report by Kenneth W. Allen and Eric A. McVadon of the Henry L. Stimson Center, a research organization in Washington, said Israel had provided China with a range of weapons–including electronic components for tanks, communications and optical equipment, aircraft and missiles–during a relationship that began at least two decades ago. Full diplomatic ties were not established until 1997. “Both China and Israel appear to gain military and political benefits from the arms and technology transfer relationship,” the report said. “Besides seeking money from China, some Israeli officials claim the sale of military technology to China will secure Beijing’s agreement not to sell specific weapons to Israel’s enemies in the Middle East.” [Emphasis added]. Note above that the report states that although full diplomatic relations were not established until 1997, a covert relationship involving weapons and technology transfers had been going on since the 1970s.